When to call an Electrician? Do you know when it is best to call out an electrician and what an emergency electrician service is for? In this article we will explain what we can do for you and when you should call us if you have an electrical emergency in Bristol. If your lights seem to keep going out or if fuses are constantly being blown. For both of these events, we would advise you to ring us to check your electrics as there could be potentially be a dangerous fault in one of the circuits that could potentially lead to a fire in your home. If you find yourself tripping over extension cables and you are using multi-plug extensions at every socket. Overloading a socket is a bad idea and can cause fire so be extra safe and have someone install new sockets. If you have new lights. If you’ve just bought some new lights but have discovered fitting them is a bit more complicated than fitting a light shade, then it’s best to call an electrician to fit your new lights to ensure you don’t electrocute yourself and that they are fitted correctly and safely. If lights are flickering or dimming when you switch on another appliance, for example a food mixer or hair dryer, then you should call an electrician. Please do not ignore this, it could be a warning of a bigger, more dangerous problem with your electrics. If you smell burning plastic or see smoke coming from an appliance or socket. After switching off the appliance and/or socket call an electrician to get the problem investigated. Electrical safety laws have become far more precise in the last few years. If you have an old property and have not had the electrics checked for over 10 years, then it is probably time you had your fuse board and electrics checked. There are many other reasons why you may require an electrician and some may be large jobs such as a full re-wire of a house or wiring a new extension. However, this post has covered some of the smaller jobs that you may ignore or try to do yourself. 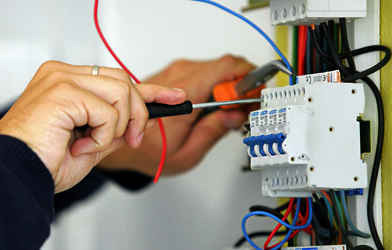 Electricity can be very dangerous so we strongly advise that you call professional electricians like ourselves to upgrade or fix your electrics.